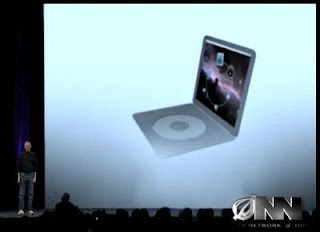 Fake news source The Onion has a video segment on a (fake) new Apple product, the Macbook Wheel - a laptop that replaces the keyboard with a giant iPod-style clickwheel. It's a parody, of course - and a good one - but it's especially funny because it hits close to home. As I've posted before, iPods have outgrown the clickwheel - what was a great solution for a basic device with a few options is a poor solution for a complex device with hundreds of options. Extrapolate to the thousands of activities on a laptop, and it becomes the stuff of comedy. And man, is it good comedy - from features like "predictive sentence technology" to the slogan "everything is just a few hundred clicks away." And Apple fans, you too - you're the guy in the video saying "I'll buy almost anything if it's shiny and made by Apple." Too true.